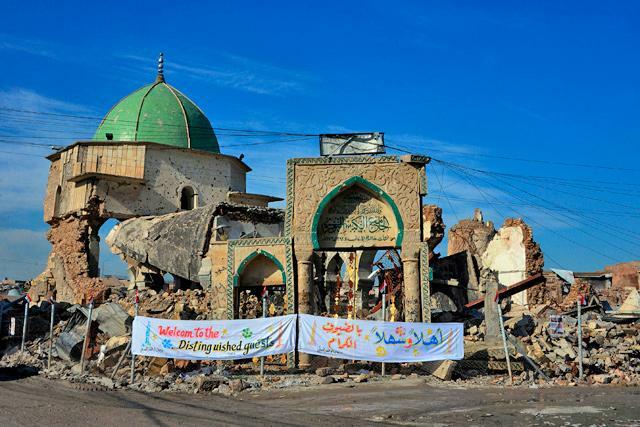 MOSUL, Iraq — Iraqis on Sunday laid the cornerstone in rebuilding Mosul’s Al Nuri Mosque and leaning minaret, national emblems destroyed last year in the ferocious battle against the Daesh group. The famed 12th century mosque and minaret, dubbed Al Hadba or “the hunchback,” hosted Abu Bakr Al Baghdadi’s only public appearance as Daesh chief, when he declared a self-styled “caliphate” after the extremists swept into Mosul in 2014. The structures were ravaged three years later in the final, most brutal stages of the months-long fight to rid Iraq’s second city of Daesh. Abdullatif Al Humaym, the head of Sunni Muslim endowments in Iraq, set down the stone in a simple ceremony. It bore a black Arabic inscription: “This cornerstone for the rebuilding and restoration of Al Hadba minaret and the Great Al Nuri Mosque was laid on December 16, 2018”. More than a year after Daesh lost control of Mosul, the iconic mosque still lies in ruins. The stone gate leading up to its courtyard and the greenish dome now covered in graffiti are virtually the only parts still erect. Abu Bakr Kenaan, head of Sunni Muslim endowments in Nineveh province, told AFP remnants of the minaret would be preserved, while other parts of the mosque would be built afresh, along with a museum about its history and adjacent homes. The first year will focus on documenting and clearing the site, while the next four years will see the physical restoration, the UN’s heritage agency UNESCO has said. The mosque’s destruction “was a moment of horror and despair”, said UNESCO Iraq representative Louise Haxthausen. “Today as we lay the foundation stone of the Nuri mosque, we are starting a journey of physical reconstruction,” she told those gathered. The mosque takes its name from Nureddin Al Zinki, who ordered it built in 1172 after unifying Syria and parts of northern Iraq.